Education Costs > How Much Does a CPR Certification Cost? How Much Does a CPR Certification Cost? Cardiopulmonary resuscitation (CPR) is an emergency practice done manually to keep oxygenated blood flowing to a victim’s brain until further measures are performed. Cardiac arrest, which is one of the top culprits of sudden death, can happen to anyone. Statistics show that over 350,000 people die from heart-related incidents before reaching the hospital each year, which could have been prevented if someone in the vicinity was there to help. In order to become certified in administering CPR, you will need to take a training class to learn the proper techniques. How much does a CPR certification class cost? On average, to receive your certification, you should plan on budgeting anywhere from $40 to as much as $125 for the course. The cost will depend on the center you choose and what’s included in your course. In-person classes will always be more than an online class. The American Red Cross offers a few CPR class paired with first aid and learning how to use an AED. The costs for their classes, according to the official website, will be in the $84 to $110 range. This cost, however, will depend on the exact class you want to take and where you live. 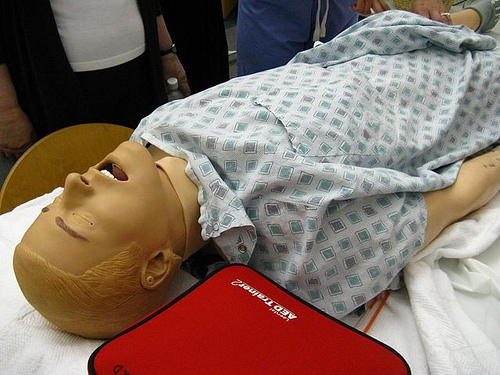 Jackson Community College, located in Jackson, Michigan, offers its Basic Life Support course for $65. Online classes are available; however, if you were to take the course online, you will still need to meet a trainer in person to showcase your skills. Most online courses through a reputable provider will be $20 to $50. The National CPR Foundation, for example, offers a standard CPR/AED course for $16.95. If you were to take the class as a group, the costs could be in the $250 to $450 range, with a minimum of six to 10 people required before the class can begin. A CPR course caters to healthcare professionals or students who have not yet experienced medical professional CPR; individuals whose cards have expired; and Emergency Medical Service personnel, doctor assistants, physicians, dentists, nurses, and respiratory therapists who are required to have credentials in CPR course. Most training provides a comprehensive BLS Course that actually covers more than just CPR. In this curriculum, you will first learn to perform CPR on an adult. Once that is complete, you will learn the techniques of performing CPR on a child or infant. After you have mastered CPR, you will also review basic first aid, such as how to effectively stop bleeding. Part of this training that has been recently added is the Automated External Defibrillator (AED) training. This is a machine that the average person can use that resembles the paddles that are used to shock a person’s heart, and it can now be found in almost any public building. When learning CPR, the trainer will usually use three different sized dummies: an adult, a child, and an infant. He or she will use these dummies to show you the proper technique and then you will be allowed to try it on the dummy to make sure you understand. Once you have completed the course, you will receive a wall certificates available for you to display. You will also receive wallet cards showing that you know the proper technique of CPR. Certification normally lasts for two years, and recertification may be done at the end of the period. The average CPR class will be two to three hours long. You have to pay additional costs for the textbook or additional study materials if they are not already provided. Even if the materials won’t be included, it shouldn’t cost more than $20 to buy everything you need. If you want to get certified in basic first aid, in addition to your CPR certification, you may have to pay an additional amount. To extend your training, the costs could be similar to the estimates noted above. Your certification will need to be renewed every two years, and a recertification should be about half of what you paid initially. Sudden cardiac arrest happens when the victim’s electrical impulses in the heart rapidly become inconsistent, causing the heart to suddenly stop beating. 88 percent of all cardiac arrest incidents occur at home. Cardiac arrest attacks more men than it does women. A heart attack occurs when blood flow to the heart muscle is obstructed. Studies reveal that heart attack victims have twice the chance of survival if they are immediately revived through CPR. An increasing number of government agencies, large corporations, medical offices, and non-profit organizations are now making CPR training mandatory. CPR was invented in 1960 by an Austrian surgeon, Peter Safar. If you opt to take an online course on CPR, make sure that the e-course provider you choose is nationally acknowledged and has a verifiable business license so that your certification can be validated. If you are nervous about performing CPR on a stranger, there are mouthpieces that have been made so there is no physical contact necessary. If you purchase one of these, keep it handy at all times or it will go to waste. Some companies offer discounts to students, senior citizens, and groups. The CPR Company, a company we found online, for instance, offers discounts to church groups and other non-profit organizations. It also provides lower training cost for groups with more than 10 participants. If you take your CPR training from Red Cross, you can save money with its free digital class materials or reasonably priced print versions. Chances are there are a handful of organizations in your area that offers this type of certification. Talk with at least three to five to see what they are going to charge. If your business or company requires that you become CPR certified, you should be able to get them to pay for some of even all of it.